In this crappy weather, I’m looking for a beer that can handle my taste for richness while still giving me a reminder that warm days are just around the corner. With Deschutes just hitting the Chicago market, I thought it would be a good chance to try what they have to offer since I hadn’t had their beers before. To my elation, I found their Red Chair Northwest Pale Ale quite to my liking. 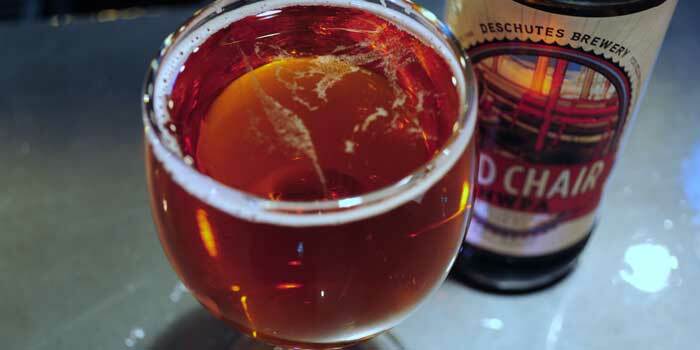 The beer pours a delicious shade of amber. It also topped itself with a beautiful, thick white head. You know how there are some beers you get from not so reputable breweries that just look and pour like they’re not going to be good? This isn’t one of them. It looks almost like a real English hand-pull. The aroma on this one is not as strong as I would have hoped for in what is called a Northwest Pale Ale, but it hits all the necessary characteristics. I got big citrus and pine from the hops. And I even detected peach and bubble gum from the malts and esters. It’s almost like the first taste of a Bazooka Joe; really different. With this beer, the flavor is not lacking at all. It’s really well balanced, but it is on the more malty side. You don’t always find a nice malty pale ale, so this is a refreshing change of pace. The bottle says they use a blend of seven malts to get this one right (even though the website only lists six of them). I don’t care too much about how many different malts they use; I’m just loving the sweet, bready and apricot fruity flavors. Mix in a bit of caramel malt, and I’m in heaven. Red Chair really is a stand out in an aisle of too many overly sweet or overly bitter pale ales. It manages to be big not only in the hops but in the malt as well. I was thoroughly impressed by this one and am disappointed that I went through the six pack so quickly. You should head out to your local good beer store and pick some up. It’s only about $10 a sixer. Really, what else are you going to spend that money on?